Improve Your Nursing School Success: Are You an Auditory Learner? Did you know that you have a very distinctive and unique way that you learn? In fact, no one else learns in the exact same way that you do! A learning style has been defined as the way that learners think, comprehend, and retain new information and difficult concepts. The average individual only uses approximately five to ten percent of the tremendous potential of the brain. One way to help reach the true potential of your brain is to discover the way in which you learn best. In this learning series, you should be able to identify the learning style or styles that best “fit” you and utilize these concepts to enhance your learning. You may find that although you use more than one learning style, one may seem to better suit you than the others. 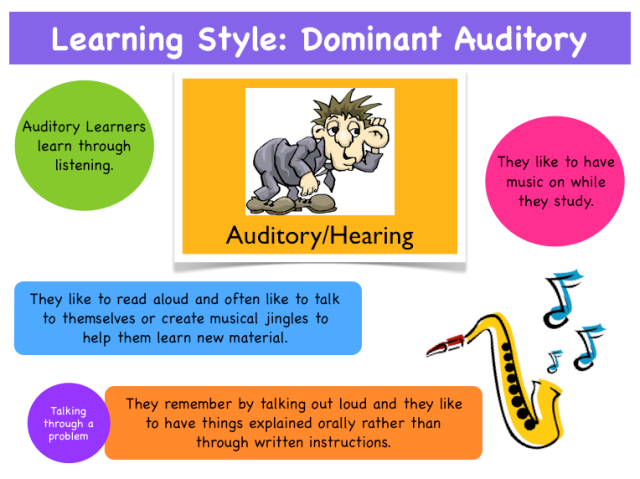 This article will focus on the auditory learner. We will explore what the auditory learner looks like, common characteristics of the auditory learner, and strategies that the auditory learner can utilize when studying to boost your self-confidence and your success! Are you the social butterfly in your class? Do you gain a sense of relief when the instructor lectures instead of presenting you with a long reading assignment? Perhaps you are one of those who participates a lot in class. Do you like to study with music playing? Well, it could be that you are an auditory learner. Let’s see! 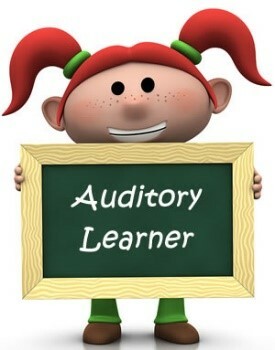 We will first take a look at the traits that seem to be common among auditory learners. Simply put, the auditory learner gains information best through listening and speaking. In fact, auditory learners can recall about 75% of what they hear in a lecture. So, let’s look at some more specific characteristics of the auditory learner and see how well you relate to this type of learner. Auditory learners tend to enjoy music and find that it can be beneficial when studying. The key here is that you select music without lyrics because as an auditory learner, you can become distracted by the other aspects of the song when words are being sung. The brain will divert its attention to the words instead of what you are trying to study. Just think, you can be ahead of the study game when you are actively engaged in class, asking and answering! By listening to the lecture and participating in the discussion, your comprehension and retention can be enhanced. Your brain will be programed to retain this information and lead to better recall when it comes time to take your test! Studying with a partner can be a great strategy for enhancing learning. It will help make learning not only easier, but can actually be more fun for auditory learners. As an auditory learner, simply having a buddy to talk with about the information helps to improve comprehension and retention. Take turns teaching each other and then ask each other questions about the material. We now know that teaching what you are trying to learn is one of the best strategies that you can use to retain the information. If a study partner is not available, teach it to yourself in a mirror, to a family member, or even your pet! This same principle can be applied to a small group setting. Just make sure that you stay on task and that it remains a study group instead of a social gathering. Reading the information that you are trying to learn to yourself or to others actually allows you to hear the information again. It may seem a bit odd or strange, but reading out loud or talking the information out loud to yourself when studying has been found to be one of the best learning strategies for auditory learners. When studying, you can send more things into your long-term memory and your brain will make deeper connections if you're not only looking at the information, but also hearing the information as you say it out loud. If things are difficult to remember, you may find it helpful to make up jingles or tunes as a tool to help you learn. If you are one who can easily remember lyrics to a song, then put that gift to use and create lyrics for your notes. You may find it helpful to either talk out or sing out mnemonics when learning difficult concepts. By recognizing your individual learning style, you can decrease your stress and frustration as you try to master your material. Utilizing strategies for your unique learning style is not meant to be limiting, but is meant to maximize your true potential! Hidden Talents. (2006). Identifying personal learning styles: About learning styles. Law School Toolbox (2013, September 6). 5 study tips for auditory learners. Peterson, D. (2017, Feb. 4) Learning ideas for students with auditory learning styles. Improve Your Nursing School Success: Are You A Visual Learner?